Those wishing to register for all USPSA Qualifiers should do so at www.practiscore.com once the registration is opened there. Come out and shoot one of the fastest growing action shooting sports in North America! It's fun for shooters of all ages and skill levels! BTSA's Steel Challenge matches are based on the Steel Challenge Shooting Association (SCSA) templates, divisions, classifications, and rules. There are 8 stages in each Steel Challenge match. 4 will be shot in the morning, with a lunch break, and 4 more in the afternoon. You can read more about Steel Challenge shooting here. To register for this match, go to Practiscore. Registration is limited to the first 4 guns per person. Come on out and join us for the Action Shooting League. Everyone is welcome, including non-members. We gather, and set up interesting shooting stages to challenge our ability and to allow us to practice our skills. The action starts around 6:00PM but we could always use a little help prior to that to set up stages, if you can make it earlier. The event will end at dusk. IDPA is the use of practical equipment including full charge service ammunition to solve simulated real world self-defense scenarios using practical handguns and holsters that are suitable for self-defense use. The main goal is to test the skill and ability of an individual. Our matches are typically Saturday morning, 8 stages, setup/first shots/completion depends on time of year but will be communicated in the match sign-up form. There is no sport specific training/certification required, we require that new shooters identify themselves, and we set them up with a “buddy” for the first few matches. Registration must be completed online at Practiscore.com under (Alberta Tactical Handgun League) by the Thursday preceding the match date. Do you have young people in your life, 7-17 years of age, who are interested in learning about the shooting disciplines? Come out and join us for a fun day of shooting a variety of firearms in a safe, controlled environment. We provide lunch, ammunition and the necessary Personal Protective Equipment. There will be a range safety officer for each shooter on the firing line, to provide supervision and mentoring on proper shooting techniques. Parents and guardians are encouraged to participate to their own knowledge and comfort level, however, they are encouraged to bring along lawn chairs to be as comfortable as possible if only observing. This is open to APRA members as well as the public. So, we encourage people to bring family, friends and neighbours out to experience how fun the shooting sports can be! As an outdoor event, it is important to watch the weather and to dress in layers. We will have water and provide lunch, however, it is always a good idea to bring reusable water bottles and snacks as we’ll be outside the whole time. Only a single parent/guardian from each group needs to register, you will then be prompted to indicate the number of "guests", and their names. This refers to the number of kids you will have with you. We have capped the kids per registration to 10 as we needed something to put there. If you have more than 10 kids, have another guardian register with the rest. Please let us know ahead of time if there are any dietary restrictions. The action starts around Noon but we could always use a little help prior to that to set up stages, if you can make it earlier. Joe B. ~ commences our season offering holster training and insights into Steel Challenge. Please register to help clean up our ranges and facilities. BTSA is a member driven organization that needs its members to volunteer to help out. Lunch will be provided to those who volunteer! We thank you for your support. BTSA will be hosting an open house on Saturday, May 18th from 10:00 am to 3:00 pm. We will have several pistols of different calibers as well as a pistol caliber carbine for visitors to shoot, followed by BBQ hot dogs. We invite members and friends to attend, enjoy and have fun shooting various guns on steel stages as well as IPSC/IDPA type course of fire. There is no cost to participants, membership to BTSA is not necessary. This event is open to the public. The Black Badge is a two day in-depth training course in the safe competitive shooting techniques required not only to compete at IPSC events but to deliver the confidence and expertise to use handguns in the safest possible manner. It is a mandatory course required to shoot IPSC matches in Canada. IPSC is a dynamic shooting sport where the principles of Accuracy, Speed, and Power are balanced in a unique scoring system. It requires competitors to shoot fast and accurately, often shooting on the move and developing techniques and styles to shave off fractions of a second between shots, during reloads and drawing from the holster. Basic equipment requirements: Pistol (minimum 9mm caliber), 3 magazines, 2 magazine pouches and a holster which must cover the trigger when the gun is holstered, a belt to mount the equipment on and 500 rounds of ammunition. For further details and information, please contact Nick at nadraz@nucleus.com. Fees for this course are collected by the instructor. Cost of the course is $275. This covers first year membership to IPSC Alberta as well. $205 if you want to handle the IPSC Alberta payment yourself, or to postpone paying the membership for your own reasons. The action starts around 6PM but we could always use a little help prior to that to set up stages, if you can make it earlier. Rick E. ~ offering holster training and providing insights in IPSC. This event is open to the public. NO RSVP REQUIRED. Registration opens Friday April 5th. BTSA is holding a Women’s Only Shoot on June 23rd, 2019 starting at 09:00. 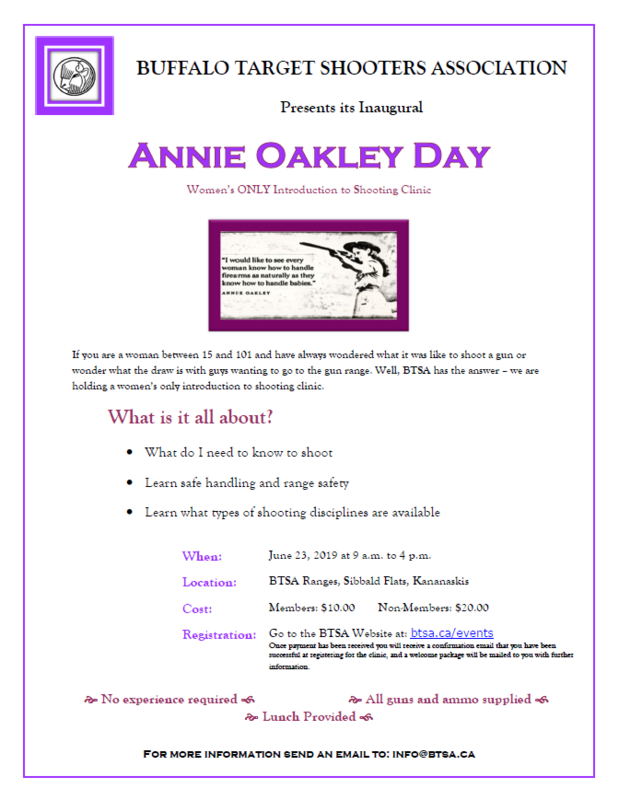 This is the inaugural Annie Oakley Day that is open to women 15 years and older. If you have wondered what the draw is to shooting and wondered what happens when people go to the firing range well, this is the clinic for you! We have planned an exciting day of introduction to shooting from how do I get a firearm - to the safety aspects - to getting out to the firing line to shoot firearms spanning in caliber from .22’s, 9mm to .223 and up. There will be lots of volunteer’s who are experienced in shooting to help guide you through the day. Be assured that your safety and comfort is our utmost priority as well as having fun and enjoy learning what shooting has to offer. At the end of the day, you will be going home with a certificate of achievement to let everyone know what you have accomplished! Watch here for more information and to register. The action starts around 9PM but we could always use a little help prior to that to set up stages, if you can make it earlier. Bruce G. ~ offering holster training and providing insights in IDPA. BJ is planning to be here for the 2019 Steel Challenge Nationals being held at BTSA July 12, 13, &14th, 2019. Similar to last year, he would like to host a 1-day Steel Challenge course, but without the snow this year. Winning stage breakdowns for all 8 Steel Challenge stages. The most critical skills to practice, and the best ways to practice them. The mental game required to have your best performance every time you step onto the range. How to vastly improve your draw speed and save seconds from your total match time. Please Note that your 2019 CNSC Championship fees are not included and you must register and pay separately for the Nationals. Space is extremely limited, so sign up today! BJ Norris is a multi-time World Steel Challenge Champion, with 2 overall titles, 7 Steel Master titles, and numerous other world and national Division Championship titles. BJ also currently holds the World Record for the Limited Divison with a total time of 79.39 seconds for the 8 Championship stages, fired at the 2017 Steel Challenge World Championship. Scott R. ~ offering holster training and providing insights into USPSA. Rick E. ~ offering holster training and providing insights into IPSC. Targets will be provided. Bring your own lunch - water provided. 1:00pm to 3:00pm: Milsurp Pistol Shoot. Each entrant gets two attempts on course with 3 paper silhouette targets at ranges of 12, 20, and 30m (10 rounds per target). Targets will be marked and scored and cumulative points from the two rounds will determine three finalists who will shoot one additional round to determine first to third places. Note that holster training is not required for this event as loaded guns will not be holstered and drawn. Each contestant will approach the firing point, which will be equipped with a table, with an empty firearm which will be loaded/made ready, fired, and made safe under the supervision of a Range Safety Officer. 90 seconds allowed for the 15 shots. Maximum 5 rounds in magazine at start of first target. Either stripper clips or extra magazines are allowed for reloading. Adequate targets will be set up such that groups of four can complete the stage followed by target scoring and retrieval (after all guns made safe and racked). Targets will be marked and tallied with winners decided by the better of their two rounds. Noon to 1:00pm: bring your own lunch. Water will be provided. 1:00 to 3:00pm: Vintage Sniper Shoot. Each contestant will get to fire 2 shots at each of 4 different sized water jugs at 100 and 200m (eight shots total). Points will be awarded as per: first shot hit 5 points; second shot hit, 2 points. The 100m targets will be shot prone, unsupported (no rests or slings); 200m targets will be shot prone with front rest (sandbag). Shooting will, again, be one at a time, and each contestant will have 3 minutes to complete the course. No spotting allowed. Two classes: 1. Factory iron sights and 2. Scoped rifle (Only original or correct reproduction scopes allowed. Target sights also allowed). To properly handicap the scoped rifle shooters, some of their targets will be smaller than those shot using sights with no magnification. 3:00 to 3:30pm: Prizes awarded. In the interests of time, each participant will only be allowed one firearm for each event. All BTSA range safety rules will, of course, be in effect and no dangerous behavior will be tolerated. The condition and safe operation of your firearm(s) is your responsibility but the organizers reserve the right to disqualify any firearm that displays signs of being defective. Eligible firearms: Firearm must originally have been used by the military by no later than 1945. Later production examples of such firearms (such as post-war Lee-Enfields) are allowed, as long as they remain in their original calibre. Participation cost: $10 per participant – payable on arrival at the event. Pre-registration required: Space is limited, so please pre-register by July 1, 2019 for this event to secure your place and help us plan logistics. Please register, providing the following information to: billandleanne88@gmail.com. *Notes: regarding display and sale of firearms and accoutrements at this event. · Items being displayed and sold are the sole responsibility of the owner and must be attended at all times. · All legal requirements for storage, transportation and transfer must be met. Trigger locks must be used when firearms are in the clubhouse, and actions open at all times – with chamber flags used. · BTSA is not liable for any damage, loss or injury occurring. · Items can only be displayed in the clubhouse during the period defined above, and must be removed from the clubhouse at the conclusion of the display period. If primary day is inclement. Joe B. ~ will end our season offering holster training and insights in Steel Challenge. Due to Thanksgiving this event will be held on the first Monday of October.